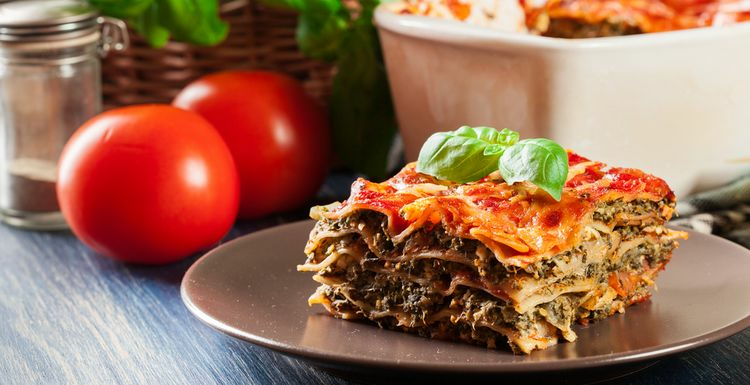 Lasagne is a perfect combination of nutrition and taste, especially if made with lots of vegetables. The problem is that the real version can be a lot of work, and the ready meal or kit versions don’t taste the same. What is a time-poor lasagne lover to do? Here’s a short-cut veggie version that doesn’t lose taste and doesn’t need processed sauces. Melted mozzarella and ricotta replaces the white sauce, and the rest needs only one pan. With pre-cooked lasagne this can be prepared in about fifteen minutes, and after baking will be on the table within the hour. Leftovers can be frozen for home-made ready meals. Meat-eaters can add mince at stage 2, just brown it before adding the veg. Get ready: peel and chop the onion, deseed and chop the peppers, slice the courgettes and mushrooms thinly. Peel and crush the garlic. Preheat the oven to gas 5/190 C.
Start cooking: Heat the oil in a large frying pan, fry the garlic and onion for a minute. Then add the other vegetables and fry until softened. Add the tomato sauce: tip the tomatoes and tomato puree in with the vegetables and mix well. Add the oregano, salt and pepper and simmer gently. Cheese sauce: whisk up the eggs in a bowl, add half the mozzarella and all of the ricotta. Assemble the lasagne: smear a little butter or oil into a large rectangular baking dish. Cover the base with lasagne sheets. Add one-third of the cheese sauce then half of the vegetable mixture on top to make layers. Repeat: lasagne, another third of the cheese sauce, rest of the vegetable mix. Finally cover with more lasagne and the rest of the cheese sauce. Top with the rest of the mozzarella. Cover with a sheet of aluminium foil. Bake for half an hour or so. Prod with a knife to see if the lasagne is ready, if not bake for another 15 minutes with the foil removed. time-poor lasagne lover - that's me! Good to have recipes that recognise those of us with long days at work also want to eat good food. genius! I can make white sauce on a good day but as the recipe says, there's a time and washing up issue. I will be trying this.